Celebrities visiting a hospital has been a cool thing to do for a while now: Christian Bale and Chris Pratt have been known to stop by to cheer up kids. The latest feel-good story comes with the new cast of Ghostbusters, who stopped by Floating Hospital for Children at Tufts Medical Center in Boston yesterday. 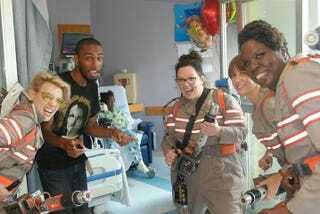 The new Ghostbusters film is currently shooting in Boston, and Melissa McCarthy, Kristen Wiig, Kate McKinnon and Leslie Jones dropped by in full costume to bring some cheer to children at the hospital. One of the really interesting things about these pictures is those horizontal bars: they’re reflective! It’ll be interesting to see if that plays a part in the film. There’s more pictures over on ComicBookMovie.